Admitted to hospital with a suspected heart attack, George is semi-relieved to discover it’s just his tonsils acting up; they’ve grown back. Kramer’s suggestion of seeking relief through alternative medicine appeals to a budget-conscious George. Larry Charles comes up trumps again. This starts out as a simple case of George being a hypochondriac but, with Charles’ anarchic sensibilities brought to bear, transforms into a poke at healthcare from all angles. Indeed, its great strength is how suited the main characters are to the different positions they are required to adopt on the subject. Charles scripts are often distinctive for latiching onto Kramer to float non-mainstream thought. Charles isn’t necessarily agreeing or disagreeing with a topic; he’s simply recognising the comic mileage he can get out of it. So Kramer, whose often unreconsituted counterculture leanings maroon him two decades from home, can espouse what he sees as the dangers of modern medicine (“Get out right now! They’ll kill you in here!”), while the highly conservative Jerry is unremittingly dismissive of the quackery of alternative healer Tor Eckman (“And you’re not a doctor, but you play one in real life”; a rare example of the show accessing a character’s interior monologue). It might seem that Jerry is proved right; George’s remedy resolutely fails (Tor turns George bluish purple, and fails to cure his tonsillitis) and he pays the price for being a cheapskate. But Jerry is as gullible as everyone else deep down (“You really think I’m eating too much dairy?” he responds to Tor’s diagnosis). 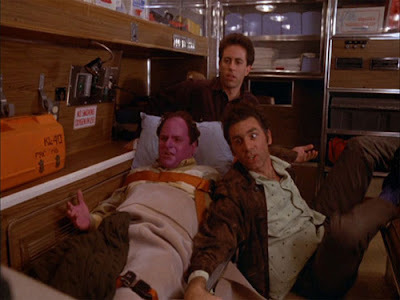 And, while Jerry and George are suffering whiplash, Kramer has made full recovery (“Kramer went to see Eckman. He feels all better already”). Right in the middle is George. He is completely impartial with regard to alternative therapies, as long as they aren’t expensive; it’s another nice twist that the most materialist character buys into hippy remedies out of parsimoniousness. George repeatedly gets short shrift from Jerry (“Why can’t I have a heart attack? I’m allowed”), culminating in the comedian’s mock smothering of his stricken friend (by this point he knows George has the all clear, but George is in the dark). George: Just take the pillow and put it over my face. Jerry: What, kind of like this? Jerry: (Pretending to be caught in the act) Elaine… What are you doing here? George’s reaction to the imminent diagnosis is priceless (“Oh, God. Mummy!”) but his relief on getting good news is predictably short-lived (“I completely skipped healthy adulthood”). Only George’s tonsils would grow back (and he didn’t even get some ice cream when he first had them out). Elaine’s date, or “Doctor Tongue” as she ends up calling him, is no less certifiable. Ever superficial, he catches her eye when he’s tending to George (Louise-Dreyfus’ giddy schoolgirl antics see them getting in each other’s way) but it soon turns sour on their date when he holds her tongue and holds forth on the organ’s wonders. By which time Elaine is thoroughly put-off (“A kiss? With the tongue? I don’t think so”). The ambulance scene is possibly a bit too broad and indelicate a means of getting to the final scene. It’s amusing, but Seinfeld usually isn’t at its best when it does “action”. The Heart Attackis also notable for the first mention of Kramer’s friend Bob Sacamano, who went in to hospital for routine surgery (a hernia operation) that was botched. Now he sits in the corner of a room intoning “My name is Bob!” Kramer is even more unhelpful than Jerry regarding George’s fears; completely oblivious, he brings a meal to George’s room and sits at the end of the bed like he’s watching him on TV. Larry David also makes an appearance; he’s in some sci-fi cheapie on TV dressed in silver foil, going on about the end of the world (“flaming globes!”). Jerry awakes laughing in the middle of the night and jots down an idea he then finds illegible; when he discovers it was “Flaming globes of Sigmund” he is very disappointed. “That’s not funny”; except that it is. Very. Larry David: The planet’s on fire! It is just as you prophesised! The planets of our solar system are incinerating, Sigmund, like flaming globes! George: Why can’t I have a heart attack? I’m allowed. George: There’s nothing wrong with me? Doctor: Well, I wouldn’t go that far. George: Lupus? Is it lupus? Doctor: And when you wake up, you can have some ice cream. George: Yeah, that’s what they told me the last time. Kramer: Get out right now! They’ll kill you in here! Kramer: The next thing you know, you’ve got a hose coming out of your chest attached to a piece of luggage! George: Oh, yeah. Holisitc. That’s what I need. That’s the answer. Tor: You should have been born in August. Elaine: I’m sorry, I can’t stay long. I don’t want to run into Doctor Tongue.